Our Met Gala Heavenly Bodies Crowns come in a number of styles. These Biblical Characters Halos and Historical Church Saints Sunburst Aura Headpieces are perfect for Christmas Pageants, Nativity Manger Scenes and Historical Church Character Costumes. Dallas Vintage Shop has a great selection of Met Gala ‘Heavenly Bodies’ Crowns, Halos, Auras & Sunbursts Headdresses like the ones from the Met Gala Heavenly Bodies Exhibition and Red Carpet Costume Collection. We have these Splendid, Detailed Met Gala Heavenly Bodies Crowns, Auras, Halos and Headdresses for Historical Church Liturgical Attire, Revered Clerical Figures Outfits & Bible Characters Costumes like those shown on the Met Gala Cat Walk Exhibition. 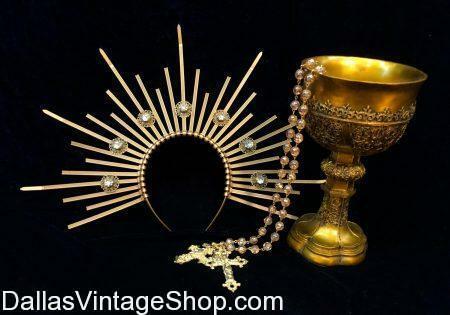 Dallas Vintage Shop has many very stylistic costume headpieces that create Auras for Saints, Angels, the Virgin Mary and other Bible Characters that looks like the Renaissance Era Biblical Paintings. These Stunning Met Gala Style Headpieces, Sunburst Halos & Crown Pieces are perfect for Christmas Pageant Costumes, Biblical Plays, Film Productions, Ecclesiastical & Bible Character Portraits & Renaissance Painting Recreations, Character Impersonators, Studio Models and Photographic Projects. Get complete Outfits for Saints, Angels and Popular Bible Characters in supreme quality or economy quality Costumes & Accessories. This entry is filed under Christmas Biblical. You can follow any responses to this entry through the RSS 2.0 feed. Both comments and pings are currently closed.